Once candidate Trump locked up the GOP nomination, in May 2016 he released a list of potential Supreme Court picks. The list was a conservative goldmine. Shortly before the election, he expanded it to 21—including Gorsuch, a judge from the U.S. Court of Appeals for the Tenth Circuit—and pledged to pick only a judge from that list for Scalia’s seat. Polls show that the Supreme Court was the #1 issue for a whopping 21 percent of voters on Election Day 2016, and that those voters broke for Trump by a huge margin of 57-40. The courts were one of his most potent political issues going into the ballot box. President Trump nominated Gorsuch on January 31 to great fanfare. The 49-year-old was confirmed in April, and by the end of the Supreme Court’s annual term in June 2017 his initial actions evidenced that he is a rock-ribbed originalist, as the president had promised the voters. But President Trump’s success did not end with Gorsuch. That was only the beginning. He began nominating dozens of federal judges to fill 167 current or imminent vacancies, and pushing them through the Senate. Article II of the Constitution specifies that only the president can nominate a federal judge, subject to confirmation by the U.S. Senate. Once confirmed, those judges usually serve for life. Some of the judges this president appoints during his tenure could still be serving on the bench 40 years from now. 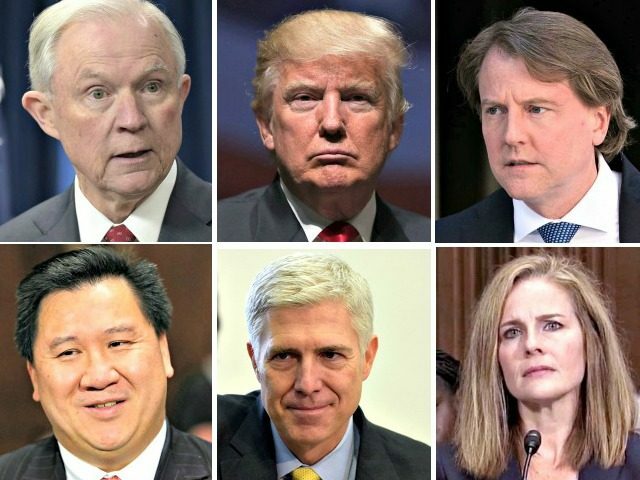 On December 14, President Trump made history when the Senate confirmed his nomination of Judge James Ho to the U.S. Court of Appeals for the Fifth Circuit, becoming the first president to successfully appoint 12 federal appeals court judges in the first year of a presidency. These appellate judges were confirmed almost on party-line votes, however. Ho was confirmed by a vote of 53-43. This came on the heels of Judge Amy Coney Barrett’s being confirmed to the Seventh Circuit 55-43, Judge Joan Larsen’s being confirmed to the Sixth Circuit 60-38, and Allison Eid’s being confirmed to the Tenth Circuit 56-41. Two of these judges (Ho and Eid) clerked for Justice Clarence Thomas, and the other two (Barrett and Larsen) clerked for Scalia. All went on to extremely impressive careers in the law afterward. Ho is of Chinese dissent, immigrating from Taiwan as a child with his parents before he could speak English. The others are women. Yet for all this, they were confirmed without more than a handful of Democratic votes. The party that claims to be for racial and gender diversity voted against judges they admitted were extremely well-qualified when those judges were openly conservative. President Trump’s appointments suggest that a White House can have a principled merits-based selection process devoid of racial and gender preferences that will still yield diverse results—including diversity of thought. The president’s record numbers were achieved despite literally unprecedented obstruction for judicial nominees. In 1986, Scalia had a mile-long paper trail as an uncompromising conservative, first as a top legal official in Republican administrations, then as a law professor, and finally as a federal appeals judge. Yet the Senate confirmed him 98-0 to the Supreme Court, with every Democratic senator acknowledging that President Ronald Reagan had the constitutional right to pick conservative judges. By 2006, most Democrats voted against the clearly well-qualified Justice Samuel Alito to the Supreme Court, with a final tally in the Republican Senate of 58-42. Yet that same year, the Senate unanimously confirmed Gorsuch to the Tenth Circuit, just as they unanimously had confirmed Scalia to the Supreme Court 20 years earlier. Yet in 2017—when Gorsuch had established a consensus-building record as a judge, being part of unanimous decisions at the Tenth Circuit 97 percent of the time, and part of the majority 99 percent of the time—Democrats tried to filibuster his nomination to the Supreme Court. That filibuster was broken only by a change to Senate rules—the “nuclear option”—in a 52-48 vote. Democratic senators who openly admitted that he was fully qualified for the Supreme Court voted against him nonetheless. Gorsuch was confirmed by a vote of only 54-45. Senate confirmations for well-qualified nominees have degenerated from unanimous for all courts (including Supreme Court), to unanimous for lower courts but party-line at Supreme Court, to party-line votes at the court of appeals. For two centuries, no president before President Trump had to combat such hyper-partisan obstruction. Both parties see the stakes. President Trump has made 68 nominations so far to the 167 current or upcoming vacancies on the federal bench, with dozens more nominees expected in early 2018. At year’s end, 19 of those nominees have been confirmed, with many more pending on the Senate floor for a final vote. Yet there are still impediments that President Trump and Senate Republicans must push through. Of the 19 judges who have been confirmed, Senate Democrats required a cloture vote for 18 of them. By contrast, there was only a single cloture vote on judicial nominations during the hundreds of judicial confirmations over eight years of the Obama presidency. Even after cloture is invoked, Senate rules allow for up to 30 hours additional debate. Each of these confirmations has been costly, yet the president and his allies have persisted. President Trump has done three things that have proven instrumental to his historic judicial victories. First, President Trump has picked the right two top-level members of his administration to make all this happen. Attorney General Jeff Sessions has been a leading national authority on the courts throughout his years in the Senate and advising the Trump campaign. In addition to the many successes Sessions has delivered for the president while leading the Justice Department, he also manages the team that is involved daily in vetting potential nominees for the bench and then getting them through the Senate. White House Counsel Don McGahn has led the president’s team inside the White House on judicial nominations, playing an “outsized role”— a criticism when coming from the president’s opponents, but high praise when coming from Republicans—in researching potential nominees for their qualifications and conservative philosophy, and recommending them to the president for nomination. Second, the president has built relationships with key coalition partners. The Federalist Society has demonstrated its unequaled capacity and potential as a vetting network and farm team for conservative lawyers and judges. The Heritage Foundation has also lent its tremendous brain-power and gravitas to helping identify and suggest potential picks for the bench. And the Judicial Crisis Network has become the foremost organization in the nation for informing voters and mobilizing grassroots support to motivate senators to confirm the president’s conservative nominees. Third, President Trump has developed effective partners in two leading senators. Senate Judiciary Committee Chairman Chuck Grassley (R-IA) has been pushing one nominee after another through his committee, and ended the blue-slip courtesy that Democrats were using to veto the president’s nominees. Senate Majority Leader Mitch McConnell (R-KY), who is sometimes at odds with the GOP base, is scoring high marks with that base for his resolve and effectiveness at successfully confirming President Trump’s judges. He moved forward on judicial nominees that the leftwing American Bar Association opposed. McConnell also pledged to keep the Senate in session for however many days it would take to burn through Democrats’ post-cloture 30-hour windows to successfully confirm the president’s nominees. The president’s critics cannot deny his success when it comes to the courts. Even the National Review has gone from #NeverTrump to #TrumpIsAwesome on judicial picks. Despite strained efforts by his opponents to deny him successes, President Trump has had phenomenal success in 2017 fulfilling his campaign promise to appoint principled conservatives to the U.S. Supreme Court and lower courts, with more in store for 2018—including another likely Supreme Court vacancy shortly before the 2018 midterm elections.